You can modify student assignments, or reset your student, by logging in via a web browser and going to Manage Account > Students. If you want to remove data because it is erroneous or not helpful, you may remove the student and add them back. By default, we assign the initial placement by age. 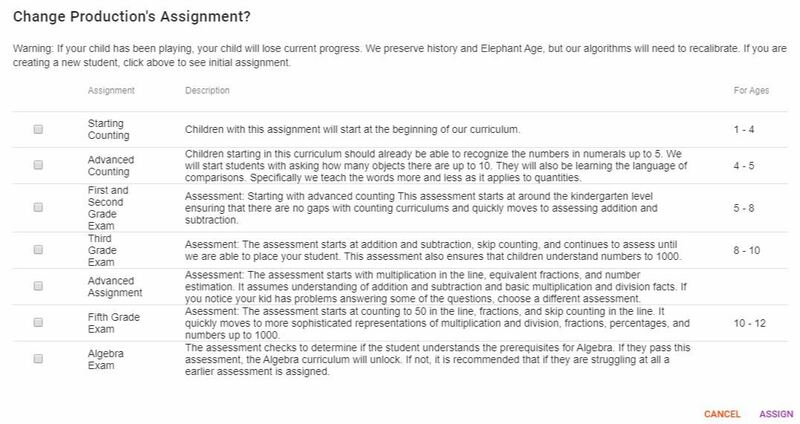 If you just want to give a student a different assessment or assignment, click on Change Assignment and choose the assignment that best fits your child. It is important for the assignment to start behind their current level so we are catching up to them, that way they do not have to fail back to our level. If your child was in the placement exam and accidentally skipped or answered a question incorrectly, then you may put them back into the assessment where they left off by choosing the subjects from the dashboard that are too easy for them and clicking on the Test Out button.